The site of a train collision accident in Bibala, Namibe Province in southern Angola. 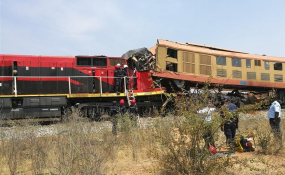 Moçamedes — The number of deaths caused by the collision of two trains in the south-western Namibe Province rose to 18, plus fourteen other citizens that are receiving treatment in hospital for serious injuries. The tragedy took place when a Moçâmedes Railway Company (CFM) train transporting black granite collided with another CFM train operating at the service of a Chinese firm that was servicing the rails. On the occasion, the second commander of the National Civil Protection and Fire Service in Namibe Province, Simão João Faísca, informed that the collission caused 17 deaths. Meanwhile, ANGOP has been informed that the number rose to eighteen.